(August 2015) -- John and Doris Norton Cardiothoracic and Transplantation Institute at St. Joseph's is now home of the busiest lung transplant program in the western United States and ranked fifth in the nation, outpacing long-established programs at major California and other western medical institutions. Surgeons performed the hospital’s first lung transplant only eight years ago. Today, Norton Thoracic Institute is the only facility in Arizona actively performing lung transplantations. It’s also on track to surpass last year’s record number of lifesaving operations. To date, more than 340 lung transplantations have been completed at Norton Thoracic Institute—a remarkable number reached by only a handful of the nation’s hospitals. In 2014, Norton surgeons performed 73 lung transplantations, surpassing University of California Los Angeles; University of California San Francisco Medical Center; Stanford University Medical Center; University of Colorado, Denver; University of Utah, Salt Lake City; and University of Washington, Seattle. Norton’s outcomes are strong with one-year survival rates above the national average—near 90 percent. Prior to the launch of the St. Joseph’s program, many Arizona lung transplant candidates had to travel out of state for the complex procedure. Currently, nearly 1,700 people nationwide await a lifesaving lung transplant. The vision for Norton Thoracic Institute is “to be an internationally recognized center of excellence in cardiothoracic disease and transplantation,” says Director Ross Bremner, MD, PhD. 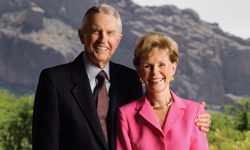 The institute was established in 2014 with seed funding from John and Doris Norton. In addition to expanding the lung transplant program, the Norton’s gift enabled the hospital to create a thriving telehealth program.